Well-known South Island geoscientist Paul Angus will be outlining the scope for opening up the Golden Blocks in a presentation at the 2018 AusIMM New Zealand Mining Conference in Tauranga. 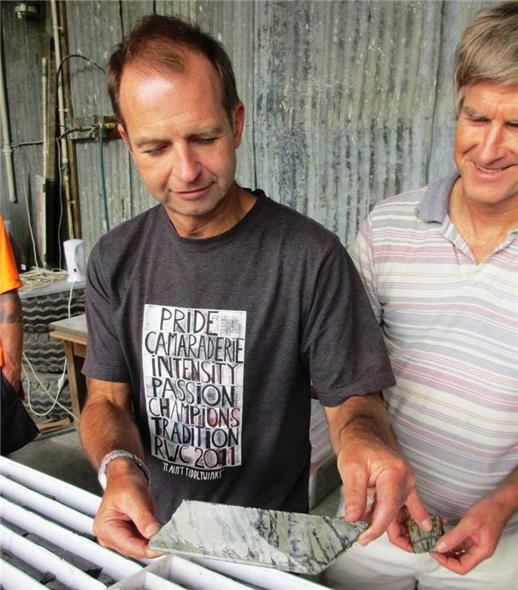 Angus, who has run exploration and development projects at Macraes and Sams Creek, is giving a paper with M Howard on Golden Blocks on the second day of the conference, September 18 at Tauranga’s Trinity Wharf. The historic Aorangi mine, also the subject of an AusIMM Nelson Discussion presentation this week by John Taylor, was developed over four levels to a depth of about 120 metres. Angus said the shallow and relatively brief historic mining at Aorangi and elsewhere on Golden Blocks may have geological analogies to other mines in the region that have had long and deep-mining lives. Angus considers the Aorangi mine shows evidence that the high-grade shoots mined from surface to No 4 level could continue at depth. He said some of the Reefton mines were developed to depths of over 500 metres and Birthday Reef at Blackwater was developed to over 700m, with drilling confirming the reef continues to a depth of at least 1.1 kilometres. 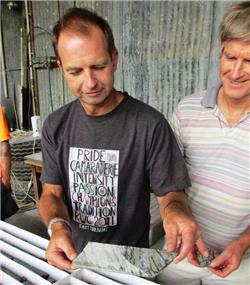 Paul Angus checking drill core at Sams Creek in 2012.